Who should not take Simponi ARIA Vial? This medication is used in combination with another drug (methotrexate) to treat a certain type of arthritis (rheumatoid arthritis). Golimumab belongs to a class of drugs known as TNF blockers. It works by blocking a protein (tumor necrosis factor - TNF) in your body's immune system that causes joint swelling and damage. Golimumab helps slow joint damage and reduce joint pain/swelling so you can move better. Read the Medication Guide provided by your pharmacist before you start using golimumab and each time you get a refill. If you have any questions, ask your doctor or pharmacist. This drug is given by slow injection into a vein by a health care professional, usually over 30 minutes. After the first dose, this medication is usually given again 4 weeks later, then every 8 weeks as directed by your doctor. The dosage is based on your weight. What conditions does Simponi ARIA Vial treat? Redness, irritation, or pain at the injection site may occur. If any of these effects persist or worsen, tell your doctor or pharmacist promptly. Tell your doctor right away if you have any serious side effects, including: easy bruising/bleeding, numbness/tingling of the hands/feet, unsteadiness, unexplained muscle weakness, vision changes, muscle/joint pain, butterfly-shaped rash on the nose and cheeks, symptoms of heart failure (including swelling ankles/feet, trouble breathing, unusual tiredness), signs of infection (such as fever/chills/cough/persistent sore throat, unusual sweating), symptoms of liver damage (including dark urine, persistent nausea/vomiting/loss of appetite, stomach/abdominal pain, yellow eyes/skin). Golimumab can commonly cause a rash that is usually not serious. However, you may not be able to tell it apart from a rare rash that could be a sign of a severe reaction. Therefore, tell your doctor right away if you develop any rash. List Simponi ARIA Vial side effects by likelihood and severity. Before using golimumab, tell your doctor or pharmacist if you are allergic to it; or if you have any other allergies. This product may contain inactive ingredients, which can cause allergic reactions or other problems. Talk to your pharmacist for more details. Before using this medication, tell your doctor or pharmacist your medical history, especially of: blood/bone marrow problems (such as low red/white blood cells and platelets), certain brain/nerve disorders (such as multiple sclerosis, Guillain-Barre syndrome), cancer, current/recent/repeated infections (including fungal, hepatitis B, tuberculosis), heart disease (especially congestive heart failure), lupus, seizures. Older adults may be more sensitive to the side effects of this drug, especially the risk of infections. What should I know regarding pregnancy, nursing and administering Simponi ARIA Vial to children or the elderly? Some products that may interact with this drug include: other TNF-blockers (such as adalimumab, certolizumab, etanercept, infliximab), other drugs that weaken the immune system (such as abatacept, anakinra, cyclosporine). Does Simponi ARIA Vial interact with other medications? Laboratory and/or medical tests (such as complete blood counts, liver function, skin exams, TB/hepatitis B tests) should be performed before you start treatment, periodically to monitor your progress, or to check for side effects. Consult your doctor for more details. Not applicable. This medication is given in a hospital or clinic and will not be stored at home.Information last revised August 2017. Copyright(c) 2017 First Databank, Inc.
Are you taking Simponi ARIA Vial? Are you considering switching to Simponi ARIA Vial? 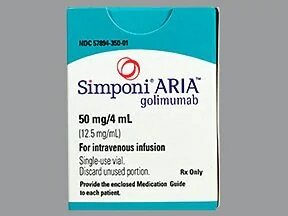 How long have you been taking Simponi ARIA Vial?